Get out of your comfort zone. As I have explained, we consider ourselves athletes. We never played college or pro-sports, but what we do do is get out of our comfort zone, and I personally try to get their daily. Ironman training became routine — swim, bike and run. I found regular times to train, regular routes to bike and run. So we would mix it up, and the fun part was that race day you were always out of your comfort zone. 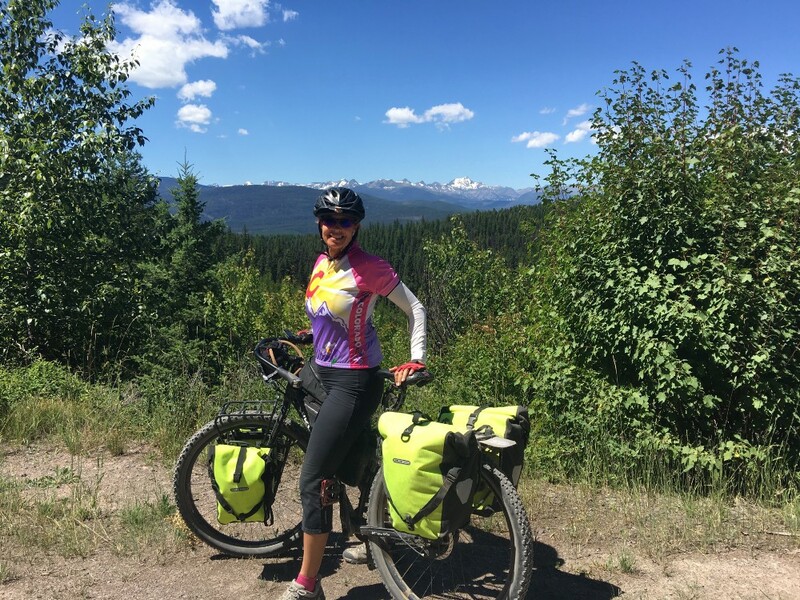 When we biked across the country, each day was way out of my comfort zone, as we were never sure exactly where food, water, or places to stay might be. The maps did a great job guiding, but everything, everyday was completely new for us. It’s interesting that almost three years after the ride, my brain remembers each day as if was yesterday. I can remember people, I can remember smells, I can remember conversations with strangers who we met along the way. When John and I talk about the trip, it is always with fondness, a smile on our face, and a pride of accomplishment. So let me ask you, when was the last time you got out of your comfort zone? As a part of our series interviewing experts on how to live a “ravenous life” — a life filled with the passion, pleasure, playfulness and abundance that come naturally to those who dare to be authentic, I had the pleasure of interviewing author and philanthropist Carrie Morgridge who is the Vice President and Chief Disruptor of The Morgridge Family Foundation. The mission of the Foundation is to invest in transformative gifts. 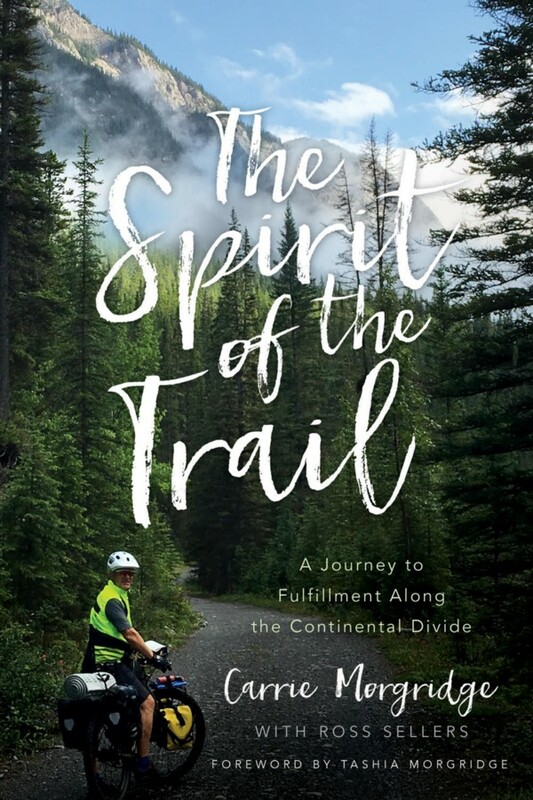 Carrie is the award-winning author of Every Gift Matters — How Your Passion Can Change the World and The Spirit of the Trail: A Journey to Fulfillment Along the Great Divide, which chronicles her and her husband John’s recent 2,774 mile, 46 day, cross country bikepacking trip along the Continental Divide. On a winter day in February 1991, I married the man of my dreams. Smart, witty, athletic he had it all. We were living in the bay area, and what happened in Silicon Valley was a phenomenon of successful technology companies. It turns out that the man I married — his father — John P Morgridge had taken a company called Cisco Systems public. As the wealth became greater, so did the responsibility of giving it away. John and Tashia Morgridge were always a giving couple and it was no surprise when they shared with us that they were one of the first families to sign the Giving Pledge with Bill and Melinda Gates and Warren Buffet. For the past two decades, I have been actively involved with our foundation, The Morgridge Family Foundation. Our foundation is a spin off from John and Tashia Morgridge. Opportunity and freedom was offered to me, and I have never regretted one day of learning how to become a philanthropist. I have over two decades of working tirelessly at the foundation and what I have learned is that each one of us has a purpose in life. Sometimes you have a calling, other times it’s not so obvious. My purpose has evolved through life, from a young girl in a small town, to becoming an author, philanthropist and life long learner. My purpose has changed over the years, and I feel that putting good and kindness back into the universe is my current calling. There is enough bad news everyday constantly thrown at us, so I fight back with love. I am not a Pollyanna, but find your passion and follow your dreams. You do not need wealth to live a fulfilled life. In my second book, The Spirit of the Trail, we didn’t know where our next meal would come from, nor did we know if we might be able to replenish our water. This brought back memories of my high school days, when I moved out, supported myself, and had the same issues. It had been over 25 years since I had re-experienced these feelings, and all of the emotions of being hungry reminded me why I fight so hard for homeless issues, foster care children and food pantries. I know the feeling of hunger and the empathy it created in me will never be forgotten. I share the same sentiments with our friends that America is the best country in the world. When was being in the top 10% of all countries in happiness a bad thing? Could we do better? Of course we could, but look at the countries at the bottom of the report. War, famine, lack of public education, lack of food, water or sanitation. In America we have it all. I am grateful that I was born in the greatest country on the planet and no report is going to change my view. Over the years, our foundation has learned to empower others to be the best they can be, to drive transformation, and help through a hand up, not a hand out. We believe that to solve the world’s most pressing challenges we must do it together. At our foundation it is not about me, it is about partners, it is about change and it is 100% about dignity. I use my voice, when others cannot. I stand up for what is right and just, when others might not have the opportunity. If we all did one act of kindness a day, no matter what level of success or status you have in your own life, the world would be a better place. 1. Appreciation for being loved. My husband, who loves me more than anything, has this great saying, “I only like to hang out with people who think I am wonderful.” Each morning when I wake up, the very first kiss I get, is from our dog, Nina, as she too is ready to start the day. The next kiss is for my husband. I have never taken this for granted, and I surround myself with people I truly like and want to be with. I have a habit throughout the day, of telling people I love them, and I often end calls with “I Love You” — albeit it’s such a habit, that it can be awkward when I am hanging up on a business call. I tend to laugh at myself when I do this, but I think there is enough mean in the world, that putting out a little love over the phone isn’t such a bad thing. If you have never had a pet, try fostering or loving on your friends’ pets. The love comes back immediately, and most of my friends state they could never live without theirs. You may not be able to surround yourself with humans who are great, but most dogs and cats that I have shared time with love effortlessly. 2. Diet and exercise go hand in hand for me. Most might say that I might be a little extreme with regards to these items! About six years ago, when my dad had a health scare, his doctor shared that he could reverse his medical issue with a great plant based diet, no oil, no meat. When we saw how awesome dad looked six months after he started, my husband and I together tried the lifestyle change — from Dr. Esselstyn’s book, Prevent and Reverse Heart Disease — and have never gone back. That was seven years ago. I feel so much better, I have become a great cook, as it is easier than going out, and we love food. To be honest, food just tastes so much better. And if that isn’t extreme enough, I have competed in nine ironman races, one full and eight half iron-mans, and when my back was fused from slightly overdoing it, my husband and I mountain biked across the country on the Great Divide Mountain Bike Route, using maps from the Adventure Cycling Association. Exercise for me is a way of life, and I can get testy when I don’t get my heart rate up. No matter where I am in the world, I always make exercise a priority, even if there is only enough time for 100 push ups and sit ups. 3. Give back. No matter where you are financially in life, there is always a way to give back. In my book, Every Gift Matters — How Your Passion can Change the World, I write about finding your passion and applying it in any way you want to your daily life. For example, my right hand guy has a passion for growing food and flowers in his garden. It is such a beautiful garden, our kids have had their graduations, engagement parties, and our son is getting married this coming summer in their backyard. Besides the clear fact of beauty, what is so special about the garden is the amount of produce they grow and donate. They are located in the heart of Denver, and there is a need throughout their community. They partner with Metro Caring, a unique food bank, (because they offer more services than just food) and each summer/fall season they harvest and donate over a ton — that’s two thousand pounds — of food. They took their passion, identified the need, and then lovingly gave back. Volunteering is a great way to give back, and the internet has made volunteering as easy as can be. Here’s the important part — do not make giving an obligation. If you do this, you have missed the point, and you have missed the value of the love you get back from giving. When giving becomes mutually beneficial, there is no stopping what can be accomplished. 4. Keep the faith. When I was a little girl, I attended church with my grandparents every Sunday, but when my parents divorced and we moved to a different city, we never found a church again. Ironman and training became my Sunday faith, and I shared with our children that God didn’t take attendance. But I wasn’t connected. As I started the process of writing my first book, a dear friend of mine, ran into his book agent at church and recommended that he represent me. As I got to know my agent, Robert Wolgemuth and his wife Bobbie, I learned their strong relationship with God, listened to them sing together, and then watched first hand, as Bobbie slowly deteriorated with cancer. I witnessed their faith, their strength and their love. This inspired me to rekindle my faith, and I can say, that my life is better than it has ever been. While I still don’t go to church, I know my own relationship with God. 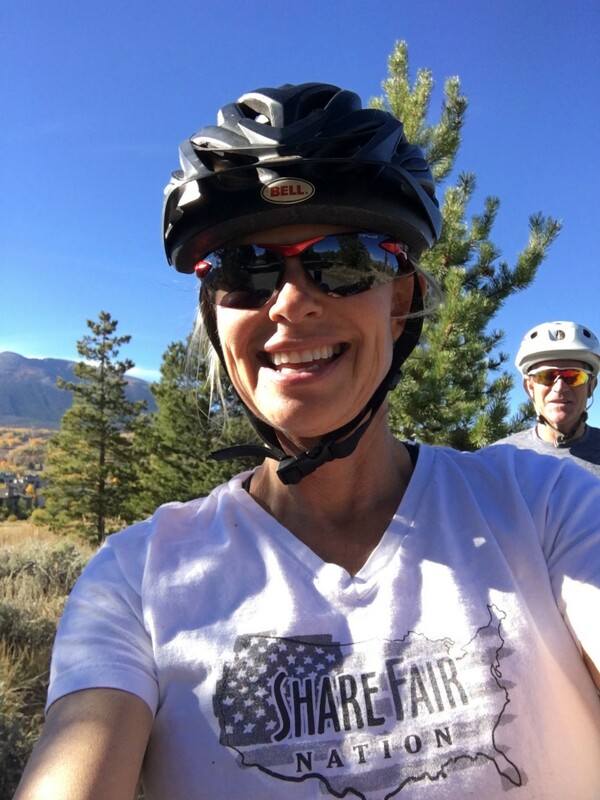 When I biked across the country, I prayed everyday for strength and safety for my husband and I. When I saw this incredible hatching of the most beautiful butterflies on the journey, I pictured in my heart that Bobbie Wolgemuth was with me. Each time a butterfly landed on my body, I felt that she was with me, and protecting me. In my mind a sign from God, simple yet ever present. 5. Get in touch with nature. When was the last time you took off your shoes, and walked on the bare ground? Or when was the last time, you dipped your body in a lake and just swam and played? I live in a place where my husband and I can have morning coffee/tea outside, and we make a point to sit together outside each and every day, and rainy days are a bonus. We are not just avid athletes, our love for nature comes out in everything we do, and I do credit the beauty and our appreciation of nature to our happiness. I especially enjoy nature when I am unplugged. There has never been a place that within a few miles, I can’t find a river to walk, a hill to climb, or a field to enjoy. It does take effort to find magical places, but I think you might be surprised how close they are to your own backyard. 6. Get out of your comfort zone. As I have explained, we consider ourselves athletes. We never played college or pro-sports, but what we do do is get out of our comfort zone, and I personally try to get their daily. Ironman training became routine — swim, bike and run. I found regular times to train, regular routes to bike and run. So we would mix it up, and the fun part was that race day you were always out of your comfort zone. 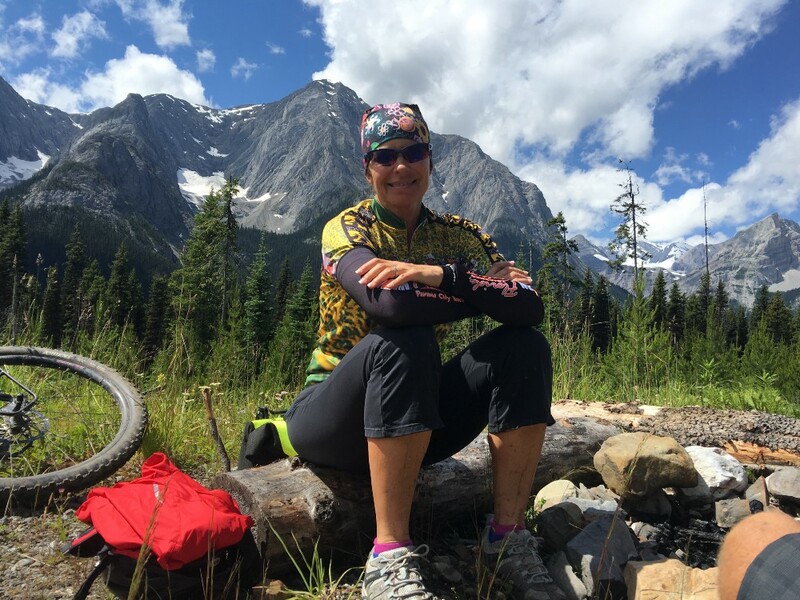 When we biked across the country, each day was way out of my comfort zone, as we were never sure exactly where food, water, or places to stay might be. The maps did a great job guiding, but everything, everyday was completely new for us. It’s interesting that almost three years after the ride, my brain remembers each day as if was yesterday. I can remember people, I can remember smells, I can remember conversations with strangers who we met along the way. When John and I talk about the trip, it is always with fondness, a smile on our face, and a pride of accomplishment. So let me ask you, when was the last time you got out of your comfort zone? Do you have any favorite books, podcasts, or resources that most inspired you the most to live with a thirst for life? I am inspired daily by others, and I am a huge podcast gal. I enjoy listening to The Arthur Brooks Show, Mike Rowe, American History Tellers, Stuff you Should Know and How This is Built. All the shows make me think or reflect. I enjoy listening, learning and then talking about the shows with friends and colleagues. My number one quote is “Feed the Hungry”. So often we will come across an organization or a program that needs more. What they might need to transform their own work can be found with someone or something in our MFF network. However, if people don’t want what you have to offer, it’s just a waste of everyone’s time. So we put “it” out there, and if they are hungry enough, they come asking for more. If not, no harm no foul. This saying can be a double entendre for me personally and comes in handy when we are working with food pantries and homeless. I have never been so excited about the future as I am today. In education we are seeing a revolution sweep in with change — change in a good way, that needed to happen years ago. The time has never been better for social justice reform, for better veteran care, or animal welfare. The medical industry is on the brink of breakthroughs we would have never thought about just five years ago. I am positively hopeful for the future and you should be too. We are partnering with other organizations to grow faster, do more, work smarter and be even more impactful than we ever thought we could be. In all the years I have been working in giving back, the movement I am so excited to be a part of is Impact100. Empowering women to change their own community. 100 women give $1,000 and give a $100,000 transformational gift in their own community. It’s about rolling up your sleeves, digging in, and changing the world. There are currently only 46 chapters set up in America, a few in Australia, and they are on a trajectory to double in size, and then double again. I believe the Impact100 groups have the ability to give more money away with a bigger ROI (return on investment) than any other organization in the world. Check them out, all women are welcome to join. One woman, one vote, great outcomes. It will take all of us together to change the world. What are you waiting for? What a couple of pitbulls taught me about obesity.